Local residents are furious as Hammersmith Bridge has been closed by our Council "indefinitely". This is the latest development in a long-running and sorry saga of delay and neglect, in which our local Council has continuously kicked the long-postponed repairs into the long grass. Back in October we reported - to a furious response from LBHF - that the price tag for repairs had risen to £36m from the 2014 estimate of £25m. 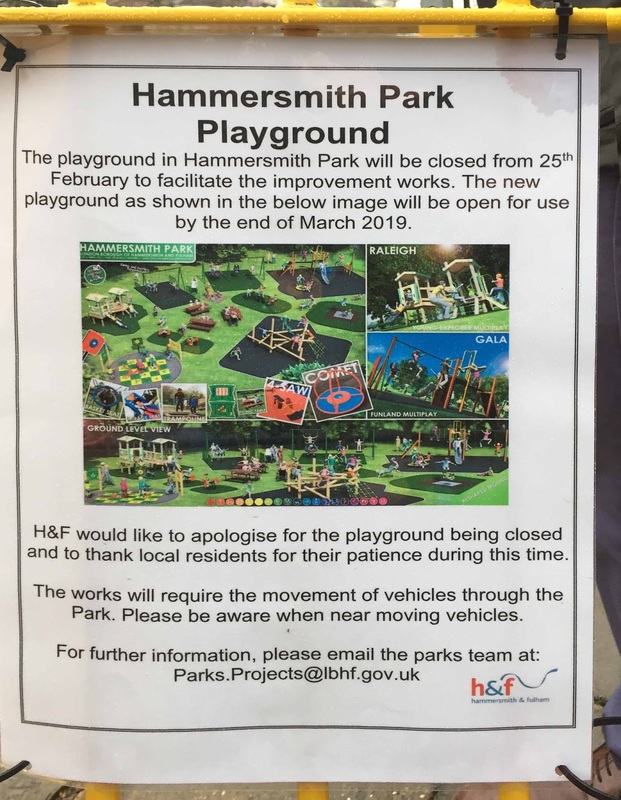 The children's playground at Hammersmith Park has been finished at last, having been redeveloped after the children's climbing frames were removed in February and March of 2018. It took a while, but full credit to our Council for getting it done, and to a high standard. 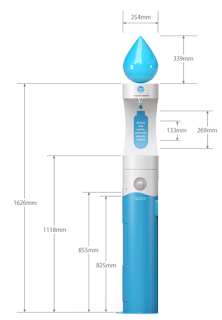 Our local Council have proposed a new water fountain for Hammersmith Park. You can see a draft of the proposed design on the left. 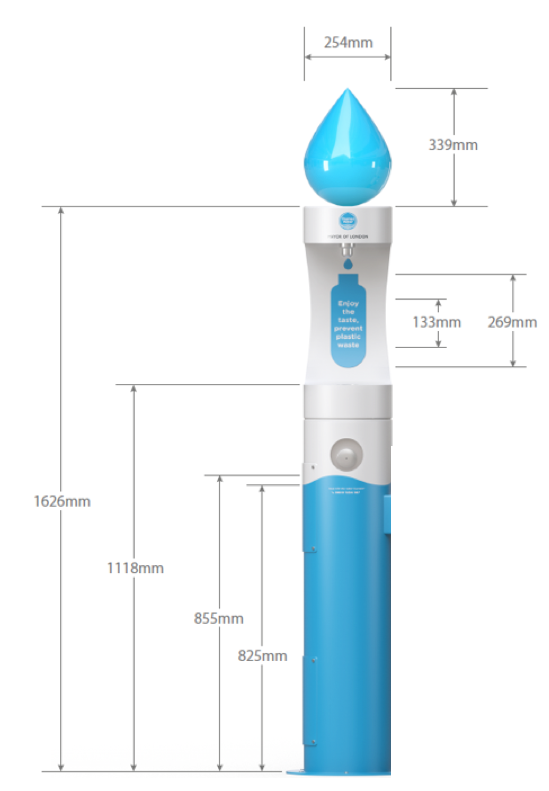 The idea is to have a new water fountain so that visitors to the park can get a drink of water on a hot day. So far, local opinion is (as is frequently the case) rather divided. A number of locals are against it, suggesting that it adds to the clutter of our neighbourhood and, anyway, why spend scarce public money on an expensive new fountain when anyone who needs a drink can always pop into Play Football and get a glass of water? Personally, I think it's a good idea, on balance. 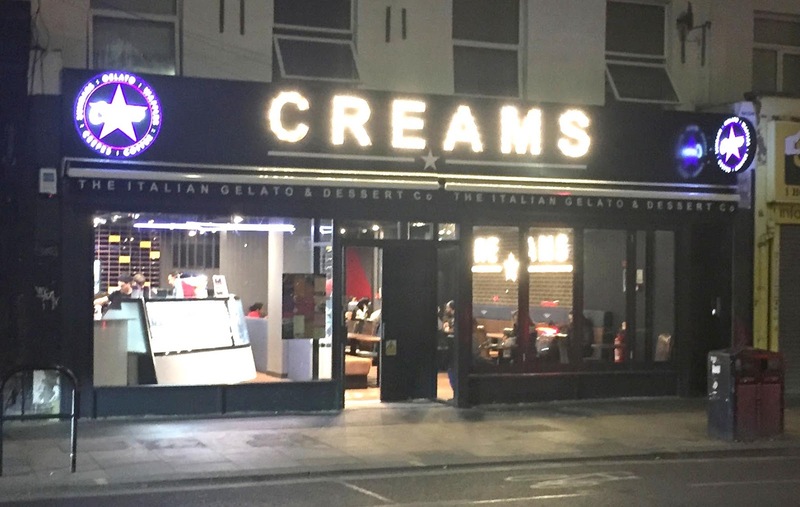 Italian Ice Cream has arrived in Shepherd's Bush; the ice cream parlour Creams has just opened on the Uxbridge Rd, in the space that used to be occupied by the unloved high interest loan outfit Oakham. Walk past its wide-open doors and you get assaulted by the sweet smell of ice cream and chocolate; the tables are filled with happy children inhaling improbably tall heaps of ice cream and sprinkles. Think of Shepherd's Bush and you might think of chicken shops, pizza and kebabs. We are - for good and bad - one of London's fast-food hubs, with delivery mopeds whizzing around our streets at all times of day and night making 24 hour deliveries. However not everyone in our neighbourhood is entirely happy. 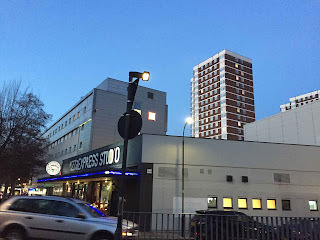 In the guest post below, Shepherd's Bush resident Edward Elletson explains why Caxton Village is getting overwhelmed by delivery drivers, and what needs to be done to fix the problem. The FunFair is Back 6-22 April - Good/Bad News? The funfair is back, from 6 to 22 April. Good news for some, but not so welcome for many local residents, especially those who live on or near Shepherd's Bush Green and hate the noise and disturbance. 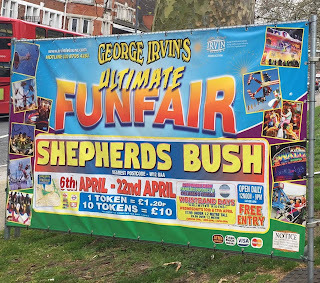 George Irvin's Funfair is a regular visitor to Shepherd's Bush. In recent years they have stayed for up to a full month, but following neighbourhood complaints our Council have now scaled them back to 2 1/2 weeks, which seems like a reasonable compromise. Mark your calendars - the Macfarlane Road Residents' Association is back, and meeting up again on 7th May. The Macfarlane Rd Residents's Assocation is a local residents' group that gathers quarterly in Shepherd's Bush to try and improve our local neighbourhood. We work with the Council and the police to try to make improvements to the sort of problems that confront local residents, such as parking and anti-social behaviour. If you're a local and you'd like to get involved, come along and have your say. A new optician has opened in the West 12 Centre but, rather oddly, they aren't open for business. 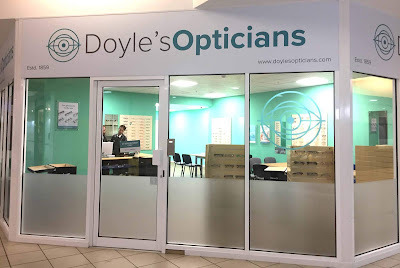 Doyle's Opticians, next door to Lidl, are not actually open to the public. When I knocked on the door yesterday afternoon, I was politely told to come back with a reservation. How to make a reservation? "Online". What sort of optician won't open their doors to a customer? The answer, of course, is an optician that isn't an optician. Props to our local council for the removal this week of one of the old phone booths on Shepherd's Bush Green. Once upon a time we needed phone booths - because hardly anyone had a mobile phone. But now, since almost everyone has a phone, they are dinosaurs, their vandalised skeletons decaying in our busy streets. Mostly nowadays they seem to be used as public urinals, or as advertising for local fast food restaurants. 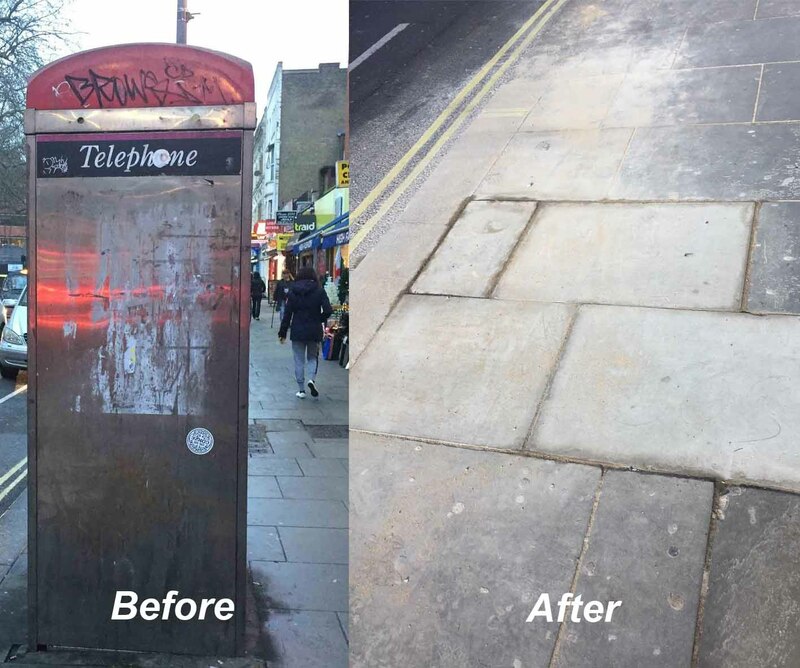 Shepherd's Bush Green can feel like a bit of an obstacle course at the best of times, so one less phone booth is surely a good thing. 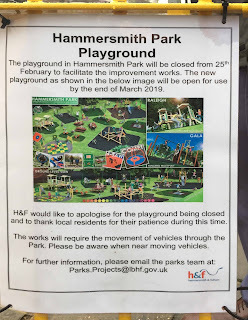 The children's playground at Hammersmith Park has been closed and fenced off, suggesting action at last after the children's climbing frames were removed in February and March of last year. Despite promises that replacement would take "a few months", a year has passed and local parents are still waiting. The poster apologising for the closure suggests that the works will be completed "by the end of March 2019". Past experience suggests that we can take that estimate with a pinch of salt, but at least we can be reasonably confident that the new playground should be in place before the summer. Hopefully. Landsec, the company that owns the West 12 Shopping Centre ,has revealed plans to demolish the back half of their shopping centre site and build a new tower. During the redevelopment, some businesses will have to close - at least temporarily - such as Vue, Fitness First and Lidl. Go around the back of the West12 and you can see why they might want to do this. The pizza Express restaurant (which would presumably also have to go) is only a one-storey building. Building up definitely makes sense for the developers. Last summer the old Esso petrol station on Wood Lane got taken over by Elephant Magazine, who promised to turn it into "a new space to act as a meeting place and hub for performance, discussion, film screenings, talks and workshops". Plus, of course, a "café, shop and outdoor garden area". As often happens these days, the plans were accompanied by a shiny digital image of what the development might actually look like. So, how did it actually turn out? There is good news for theatre lovers in White City. 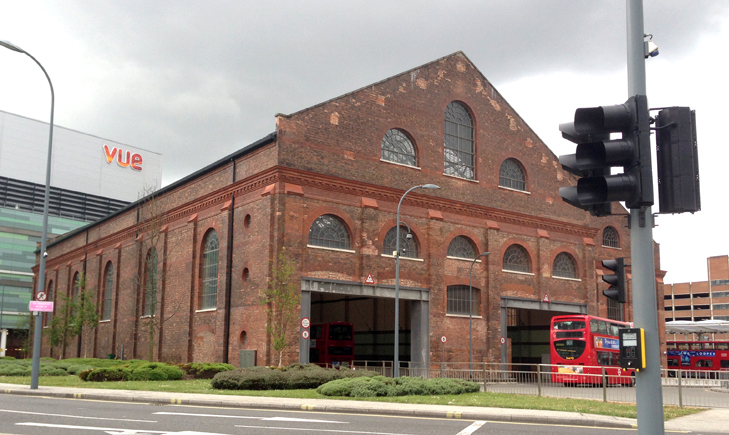 A new pop-up 1,200 seat theatre will open this summer in the old BBC car park on Wood Lane. 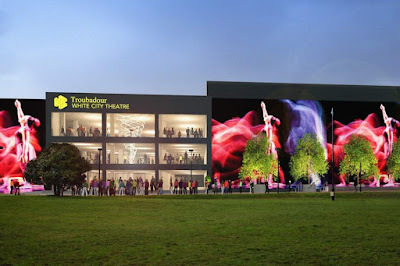 The venue will be known as "Troubadour White City Theatre", and will be one of the largest entertainment spaces in London when completed. Council Tax To Rise - But Should it? Hammersmith & Fulham Council says it will impose a 2.7% increase in our Council Tax bills from April 2019. LBHF says the rise is needed because of "central government austerity and rising demand for services". But is a tax rise really necessary? We think there is a better way. 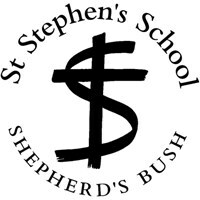 St Stephen's School on the Uxbridge road, widely admired by local parents, is having a consultation on the feasibility of expanding into secondary school education, and founding a new partner school. To this end they are having a consultation, open to parents of children at the school and the wider community. You can find the survey here - note that it must be completed by close of business today, 23 January. 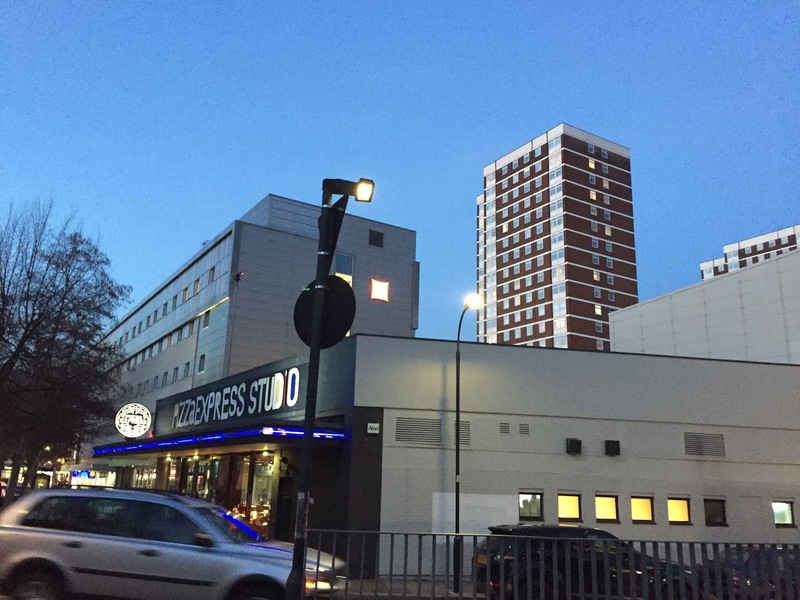 The developers of the proposed Hoxton Hotel at 65 Shepherd's Bush Green have re-applied for planning permission to demolish the old buildings and build a new hotel. If you're thinking "but didn't they already get planning permission for that?" you would be right. Planning permission for the site was granted back in 2017, but the owner of a flat in nearby Pennard Rd successfully challenged it by way of Judicial Review, and managed to get the plans quashed. 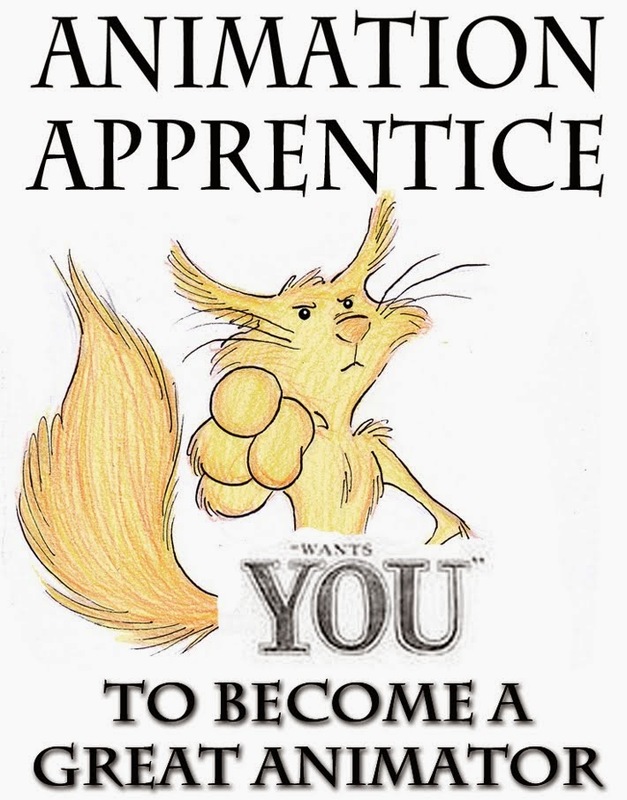 So now the developers are going back for round two. 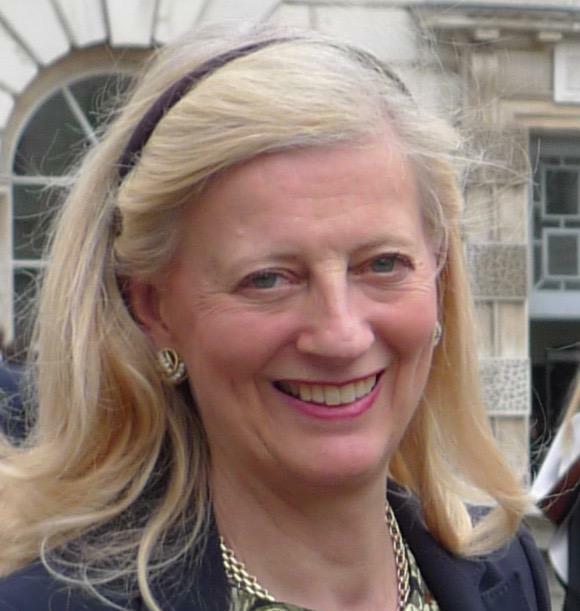 "I first walked into St Stephen’s Church in 1985 and all my family and I still attend. My position is Chair of the Church Committee, which oversees all the business of the church; but really I see my role as one of drawing people into the community that the church provides, whether it’s through being on the weekly rota for lay duties (reading, prayers, refreshments), or singing in the choir, through helping in the Sunday School, welcoming people who have moved to the area and getting to know them, or through collecting up rubbish in the churchyard and looking after the garden. Our Council has launched a new app - the "H&F Report It App" for Your smartphone. The app allows you to report problems like fly-tipping to the Council on your phone, without the need to send an email or make a phone call. Fewer police in Shepherd's Bush? There are fears that there will be many fewer police officers on the streets of Shepherd's Bush as a major City Hall funding scheme faces the axe by Mayor Sadiq Khan. 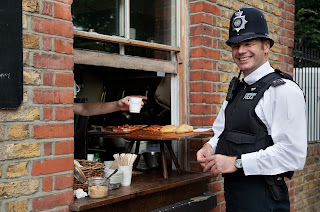 The so-called "Patrol Plus" scheme was launched former mayor Boris Johnson and currently funds 339 police officers in London - of which 48 are in Hammersmith & Fulham. DIMCO Buildings - open until 3am? The DIMCO Buildings, The Grade II listed former electrical station which sits at the heart of the Westfield shopping centre, is now an events venue. They have applied for a late-night entertainment license from our council, and the hearing date is January 16th at 10 am, in the Council Chamber at Hammersmith Town Hall. Anyone who took the trouble to comment on the application, at the official LBHF site is entitled to speak at the hearing, for or against. copyright Alexander Williams 2015. This work is licensed under the 4.0 Creative Commons License. Simple theme. Theme images by enjoynz. Powered by Blogger.